It has been the talk of the day, that Google would be making the announcement for their Google Music Store on November 16. Invitations just rolled into our inboxes and we are seeing that it is not just Google on the bill. 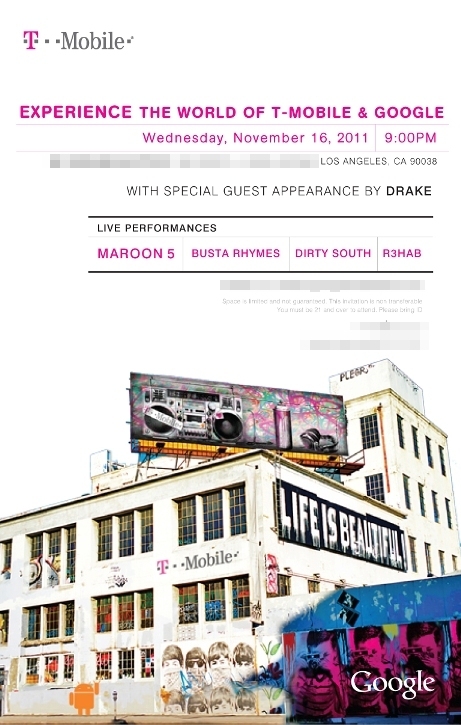 Looks as though T-Mobile is sharing the responsibilities of hosting the event and are having many top musical guests like Drake, Maroon 5, and even Busta Rhymes perform for a select crowd. Is Google Music going to be an exclusive to T-Mobile devices in the early stages? Queue frustration. Google couldn’t do that to us, could they? They did it with Google Wallet and Sprint, so I guess it’s not completely out of the question. The odd thing here is that we have all been testing their Music Beta app, so why would they lock a music store down to one of the smaller networks in the land? As a service that will be built into the Google Market, it seems odd that they would attempt to fragment that out per carrier, doesn’t it? Of course, this could all be overanalyzing an event that has yet to happen. Maybe T-Mo customers are just going to get a sweet $5 credit to the market while the rest of us just get access? Or maybe they will have the option to buy albums and bill directly to their T-Mo accounts? A lot of questions there that we probably won’t know the answers to until Wednesday afternoon. Have any thoughts? Let us know.